Paul McCartney refused to play in Regina unless everyone who worked on the show’s staging became vegetarians for the week. So they did. REGINA — A bunch of burly stage hands at Regina’s Mosaic Stadium were on a strict diet this week, thanks to Paul McCartney. 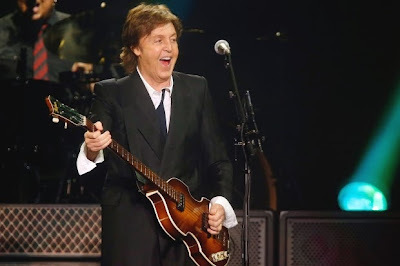 The former Beatle and rock legend, who played an outdoor show at the stadium Wednesday night, has long been known as a staunch vegan and a vehement supporter of animal rights. He even travelled with his then-wife Heather Mills to northern Canada to protest seal hunting practices in 2006. As part of the deal to bring McCartney to Regina, everyone who worked on the staging for the show got a taste of how he lives. Evraz Place vice-president Neil Donnelly said that means the workers were served vegetarian meals. “I think the bigger you get the more you want things done your way,” Donnelly said. So if it means travelling with your own folks to take care of that, they can do that. Donnelly says the workers enjoyed the meals. “Obviously there’s a few jokes flying around about people ordering pizza,” he laughs.